A “Sheltering Book” workshop was held at 430 Pico in Santa Monica, a building owned by the Community Corporation of Santa Monica (CCSM), who rents out apartments to families and others, and provides a range of programming to them. Our workshop was part of that programming, and was attended by families with children from preschool to high school. A group of volunteers provided a lovely buffet and supported the participants, who created books, and shared them in the shelter of The Sheltering Book. 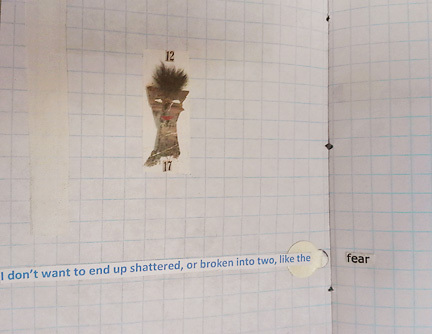 Covers and pages were prepped, and participants bound them together into a single signature book which they then added to with writing, drawing and collage materials! 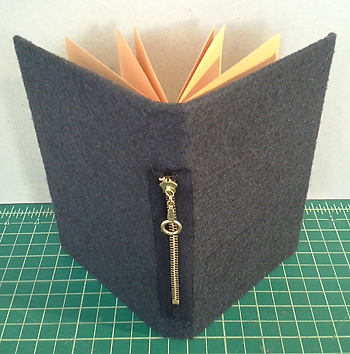 I taught the pamphlet stitch, but this young maker jumped right in, and wrote his book before it was bound! Sharing our books in the shelter of The Sheltering Book. Room for creative work here! 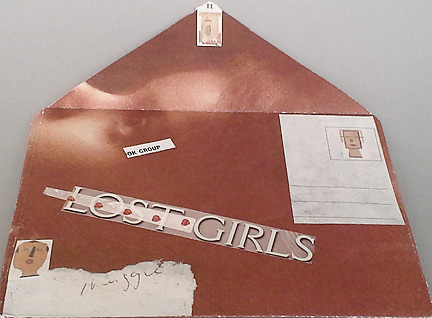 He worked long and hard with a devoted volunteer to spell out his name in letters culled from magazines. Celebration! 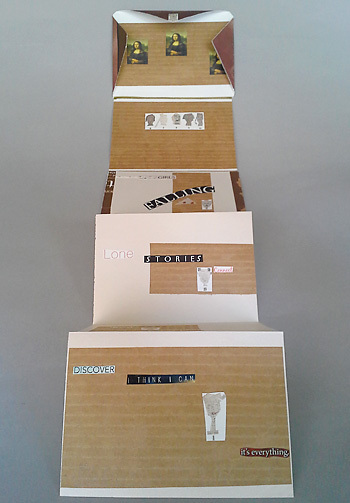 Showing our books within the pages and open “walls” of The Sheltering Book”…supported within its loving “arms”. 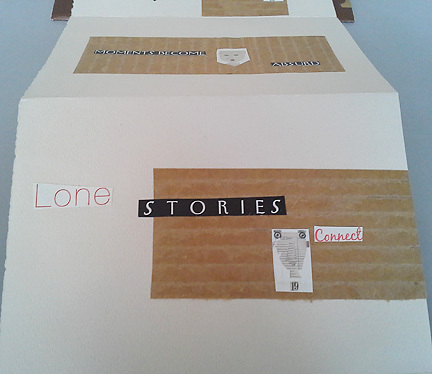 The participants become the content and the characters of The Sheltering Book. Through their presence and their creations they people its pages, add meaning to its presence, and add life to its structure.Their story becomes its story, and vice versa. 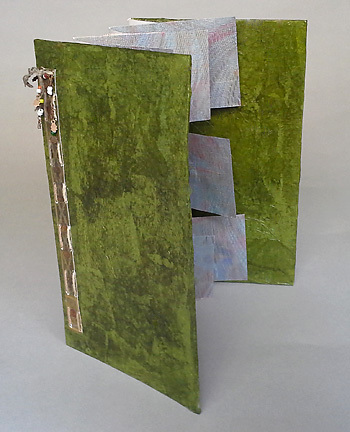 Made of corrugated cardboard, primed, base-painted, and treated with layers of transparent color, the Sheltering Book becomes a Sukkah With the addition of dyed netting stenciled with ferns, the “s’chach“, roof of the Sukkah. 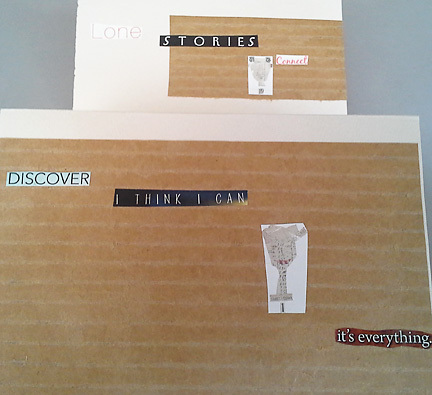 Our first community bookmaking workshop was held at the lovely Braid Theatre Gallery. 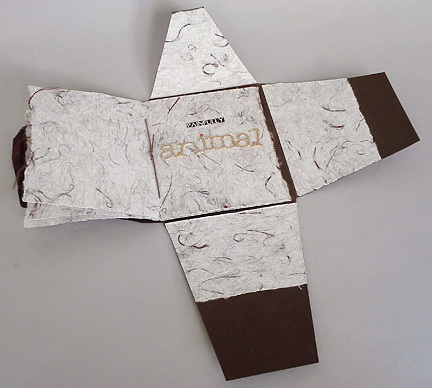 using brilliant and beautiful materials. Mother and daughter work side by side. 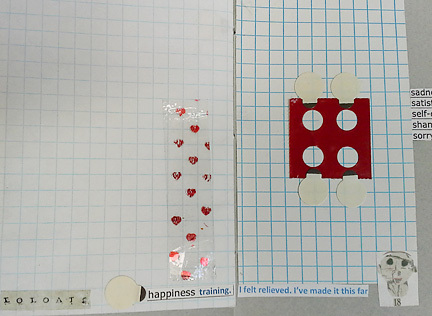 Participants focus on”building”, then developing their flag books. Then we shared….in the safety of The Sheltering Book. Was it a fluke that black was the predominant clothing color that day? Creating a striking contrast between Book and Bookmaker. 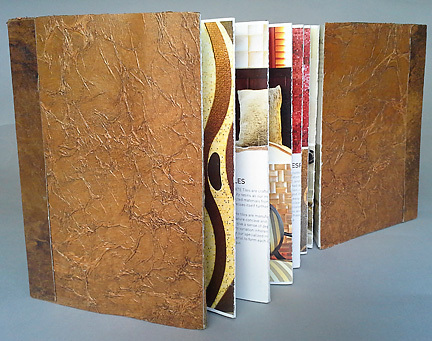 One of the pleasures and deep satisfactions of bookmaking is delving into the visual, visceral, and tactile pleasures of materials. Though many artists do not make the kind of money that allows for indulgence in what might be termed, “material pleasures”, we may be seen as materialistic…for materials are the very warp and weft of our trade. We can find our way to the ineffable through immersion in the materials and techniques we choose to create with. Here I share some of my own investigation into the qualities inherent in materials that create texture. Though I am a visual artist, I find the sense of touch as powerful as that of sight, and am fascinated with how the two work together. 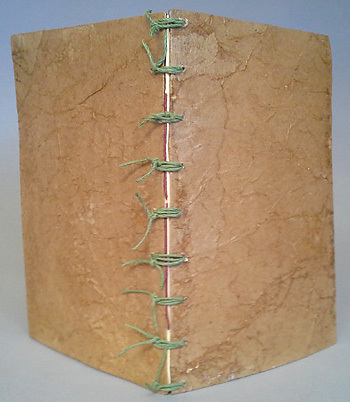 “A Stitch in Time Saves 9”, Flag Book, Title stitched onto flags, covers textured with crumpled tissue paper and adhesive, collage and repurposed beads stitched onto cover. 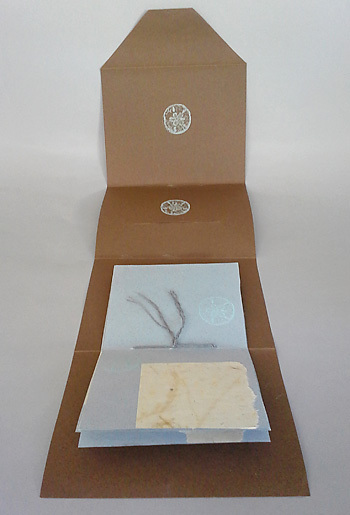 “Brown Paper Bag”, Covers textured with crushed plain brown paper and brown paper bags, bound with hemp cord. 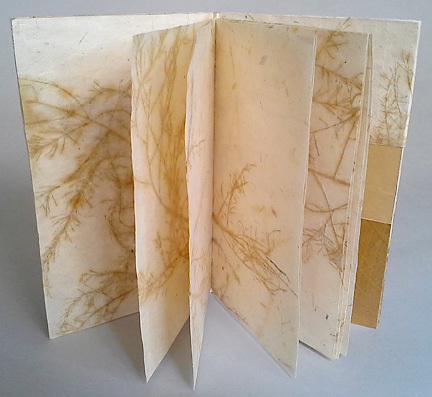 PaperPaintPlant, single signature binding, using paper containing plant material. 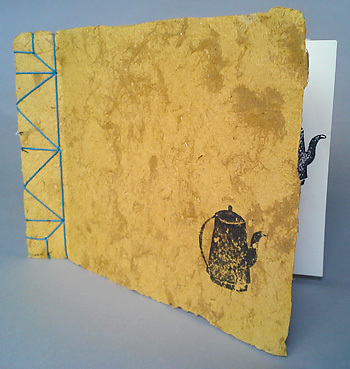 Teapot Book, Japanese Side Stab binding using thick highly textured handmade paper for covers, and drawing paper for pages, teapot rubber-stamped. The sense of sight and the sense of touch. How can we separate the two? Does something feel like what it looks like, or does it look like what it feels like? Powerful questions for anyone working in the visual, or any realm of communication and expression. Powerful stuff. 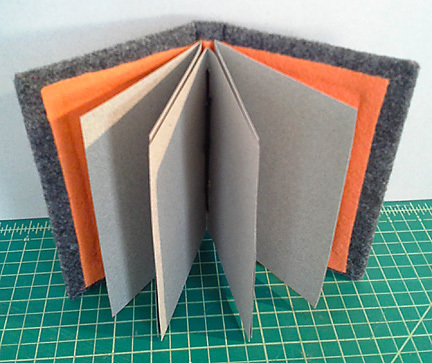 One of the pleasures and deep satisfactions of bookmaking is delving into the visual, visceral, and tactile pleasures of materials, and how to employ and combine them. The following shares one step of my journey exploring and investigating the qualities inherent in specific materials. Though many artists do not make the kind of money that allows for indulgence in what might be termed “material pleasures”, we can be seen as materialistic… for materials are the very warp and weft of our trade. We find our way to the ineffable through the use and exploitation of the materials we choose to create from. 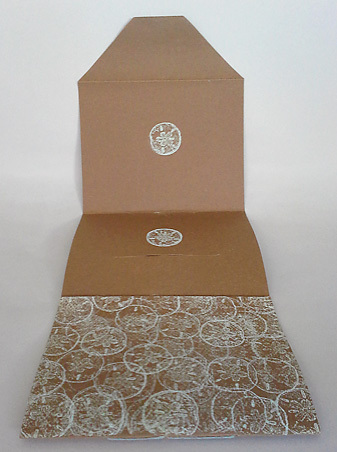 The following books are created from basic but sturdy cardboard, the kind that drawing pads are attached to, wrapped with a felt that is made from recycled plastic bottles. 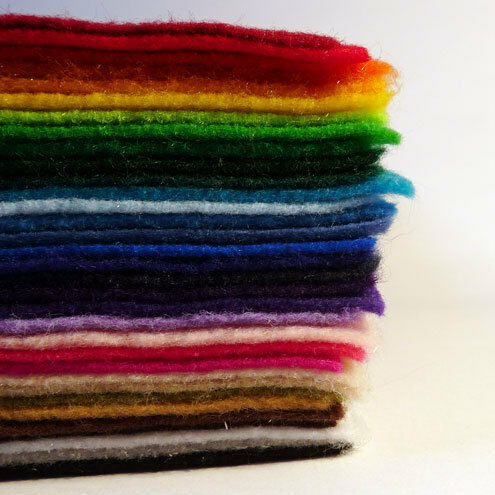 That aspect alone would lend these pieces a feel-good quality, but the fact that they become warm, fuzzy and strongly tactile books for some reason is currently irresistible to me. Playing with the single signature bound book form in this way has been pure joy. 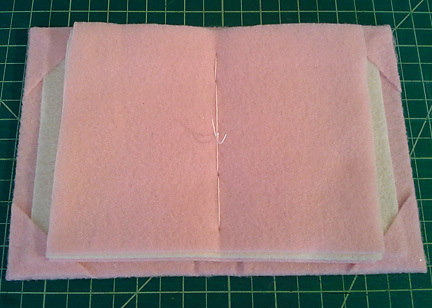 All the books employ the pamphlet stitch. 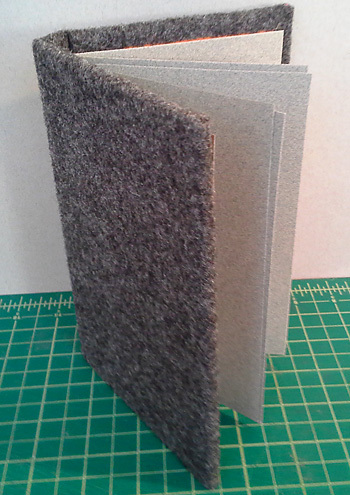 This is a multi-signature (gathering of folded pages) book structure, even though each signature is composed of a single folded page, stitched separately to a piece of felt that was then glued to the whole inside surface of the book. 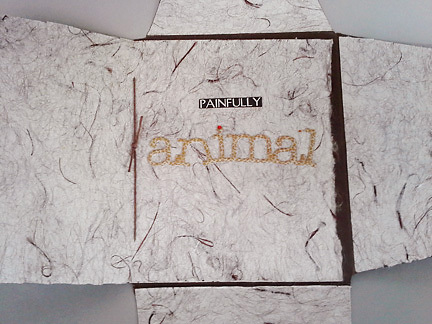 The pages are high quality drawing paper designed for pastels. 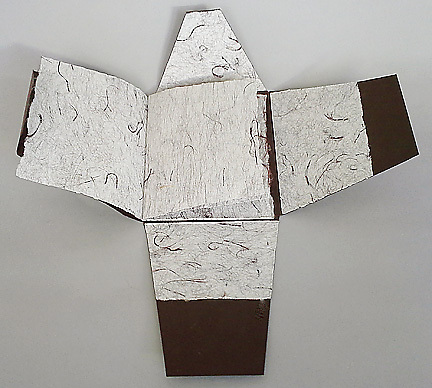 This piece is also a multi-signature structure, each signature composed of a single folded sheet, stitched separately to a strip of felt that was then glued to the spine. 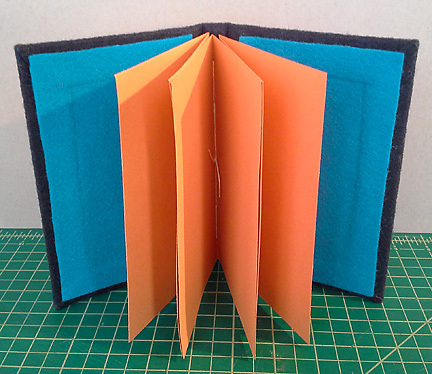 Two other cerulean blue sheets of felt were then glued to the inside surfaces of both covers. 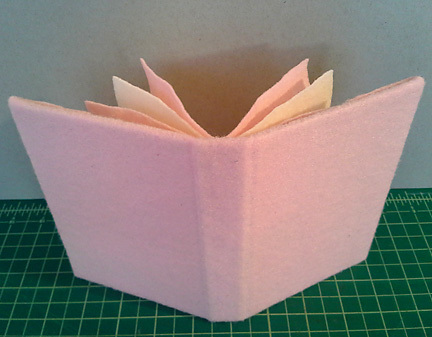 The pages are also pastel drawing paper, of a different sort. Yes, that is a working zipper on the spine. “Unzipped“? “All Zipped Up“? 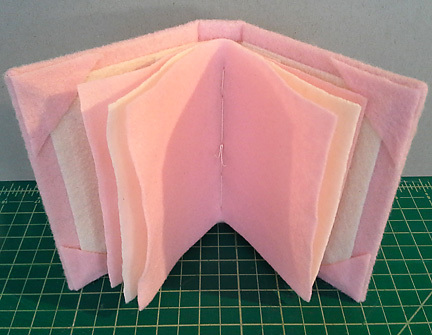 Fascinated by the use of Eco-fi felt, I wanted to see how felt pages would look and feel, and so bound this “BabyPink” book. 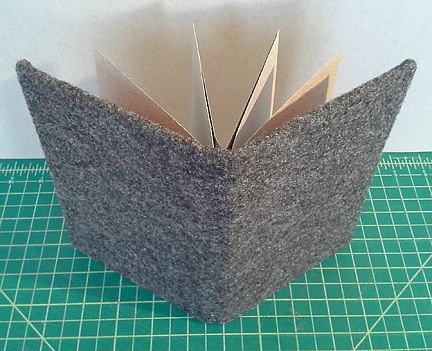 It’s 6 pages are created from a single signature of 3 folded felt pieces, stitched to a strip of felt that was then glued to the spine. 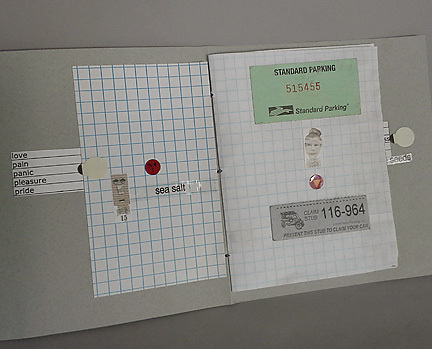 A piece of off-white felt was glued to the inside surface of each covers. 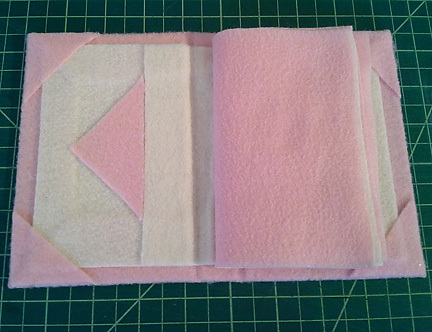 The corners that were cut off the felt “wrapper” and other felt fragments were used for embellishment, in an effort to use the felt to its fullest. In this way, such activity becomes piece / peace work.